It has been an incredible summer of programming here at RCRC, and we are so excited to launch into the fall and start up with a new fundraising initiative. For many years now, there has been a small group of individuals who have helped to fund one-off Ladies Rock Camp scholarships for folks to attend the program who otherwise would not be able to afford the tuition. In an effort to make LRC more accessible (and largely in part to our new strategic plan goals), RCRC made LRC sliding scale, as well as offering the possibility of full aid when needed. The new LRC Hype Committee (explained more in this guest post) took up the idea of community fundraising for this equitable pay system… and ran with it! With their energy and commitment, and the generosity of an anonymous matching donor, we are very excited to announce the new LRC Community Fund! 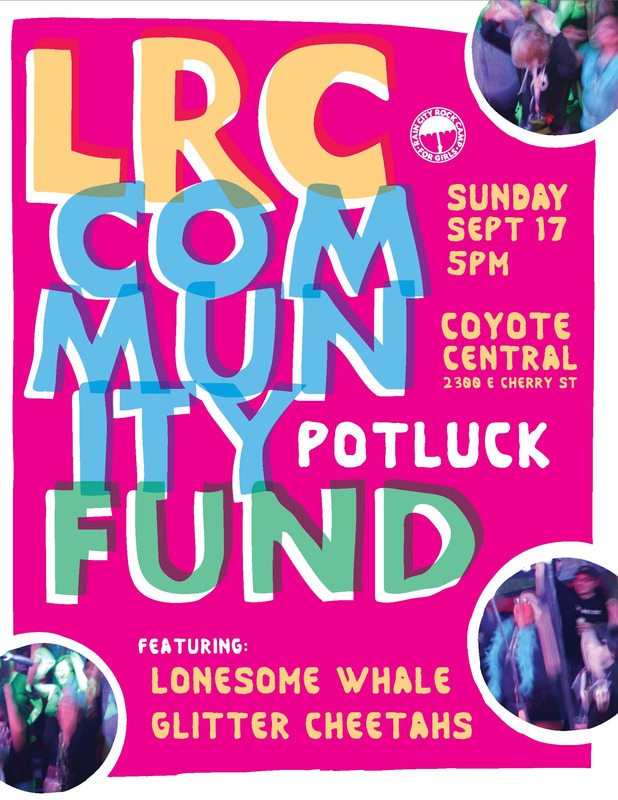 Get ready to mark your calendar, because you don’t want to miss the upcoming launch party potluck for the brand new LRC Community Fund! You heard right: Party, LRC, Community Fund. We need you to celebrate with us on Sunday, September 17 at 5pm at Coyote Central (2300 E Cherry Street). Be there! LRC stands for Ladies Rock Camp, a day camp for grownups that compresses the musical instruction, empowerment workshops, band formation, original song composition and live performance challenges of Rain City Rock Camp into a three-day weekend. LRC happens twice a year and serves as a fundraiser for the summer rock camp programs for girls and gender nonconforming youth. Do not let the word fundraiser mislead you; this is no weekend car wash and bake sale. Lauding the incredible experience that LRC offers women and gender nonconforming adults is beyond the scope of this post. Very briefly, LRC is transformative for many participants. It has literally changed people’s lives. Now you know what LRC stands for. Hype stands for “Help Your People Engage.” LRC Hype is a committee of RCRC made up of LRC community members and volunteers who have a shared mission to bring people to LRC to experience its transformative power, to bring people into the LRC community to support their continued transformation, and from there, to bring them into the RCRC volunteer community to contribute to the transformation of others. RCRC’s week-long summer camps are a critical part of RCRC’s mission: empowering girls, women, and gender nonconforming individuals to engage their creative potential through music, champion equity, and thrive in a community of allies and activists. Succeeding at this mission requires RCRC to be accessible to as many people as possible and to include people from as many different backgrounds as possible. If you are a girl or gender nonconforming youth, you belong at RCRC. To make that possible, summer camp offers a sliding scale, including full scholarships, partly funded by LRC. LRC supports the summer camp in another way as well; a good number of the adult volunteers who make the summer camp possible enter the RCRC community via LRC. Just like the youth, if you are a woman or gender nonconforming adult, you belong at LRC. Lack of money should not block anyone’s participation. Prioritizing financial accessibility for an endeavor that is a fundraiser is a tricky business, which is why we are so excited to announce the LRC Community Fund. Donations to the Community Fund will support the organization’s ability to provide sliding scale access to the program and will be matched dollar-for-dollar, up to $5000, by a generous donor from the LRC community. As a longtime Ladies Rock Camper and volunteer, I am so excited to help power up the LRC Community Fund with a matching gift, in order to activate the collaborative spirit and values of our community. I believe that we are enough, together, to provide access to LRC for everyone who wants it, and everyone who needs it. I’ve had my life changed by LRC, and I think everyone who wants to attend should be able to attend, without the added barrier of financial limitation. That is why I’m getting fierce and giving back. I am pledging to match the community’s gifts to the LRC Community Fund up to $5,000. I am doing this to encourage you all to give in a way that feels meaningful to you, as this is what feels meaningful to me- inspiring you all to give back! I know that together we can do it, because united we band, right?! Our goal for donations is donor reach rather than a specific figure. That’s where you come in. We hope that everyone in the community donates an amount that is meaningful to them individually. By making LRC accessible to the widest group of people, thereby bringing people from a wide variety of backgrounds into the RCRC volunteer community, we can, as a group, provide the youth of RCRC the opportunity to open their minds and hearts even wider. These kids are our future leaders and inspiration. Let’s give them all the help we can, and take care of ourselves along the way. See you at the party! It’s a Revolution and Everyone is Invited!